(from left)Manila Water Philippine Ventures (MWPV) South Luzon Business Development Head Real Magtangob, Tanauan Water District (TWD) Vice Chairperson Erlinda Nazareth, MWPV President & CEO Virgilio Rivera, Jr., Tanauan City Mayor Jhoanna Corona-Villamor, Manila Water Company (MWC) President & CEO Ferdinand Dela Cruz, TWD General Manager Feliciana Sumague, MWC Subsidiary Operations Group Director Abelardo Basilio, and Joint Venture Selection Committee Chairman Benedicto Capule. The Consortium of Manila Water Company, Inc. and its wholly-owned subsidiary Manila Water Philippine Ventures signed a joint venture agreement with Tanauan Water District to implement a project that will improve the provision of water supply and sanitation services in the City of Tanauan in the Province of Batangas. With an estimated capital expenditure of more than PhP1.5 billion, the 25-year deal involves the design, construction, rehabilitation, maintenance, operation, financing, expansion and management of the water supply and sanitation facilities and services of the water district. According to Manilla Water Philippine Ventures President & CEO Virgilio C. Rivera, Jr. this partnership aims to assist the water district in increasing service coverage by delivering as much as 27.5 million liters of water per day by year 2043 to the 48 barangays it serves. Tanauan Water District Board Member Manuel Lascano shared that with the developments in the city, coupled with the growing requirements for reliable water supply and sanitation services the water district sees the need to acquire reliable skills and competencies, as well as sufficient capitalization. 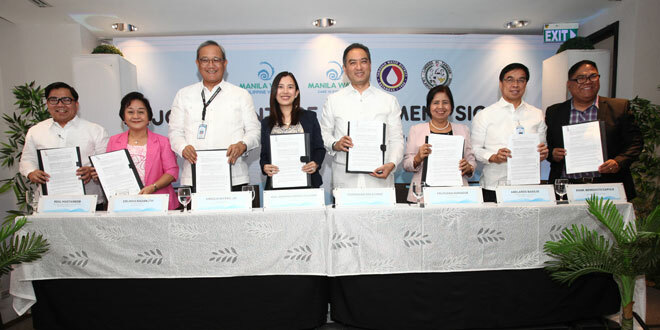 “Hence we have to look for a tested and experienced company with superior expertise over the others of similar interests, and we firmly believe that Manila Water is the best in the industry”, said Lascano. He expressed high hopes that the partnership will be a model of successful joint venture for water projects in Batangas and nearby provinces. Manila Water, through its subsidiary Manila Water Philippine Ventures, brings its brand of expertise to more locations outside the East Zone of Metro Manila, including various cities, municipalities, and communities in Bulacan, Pampanga, Pangasinan, Laguna, Cebu, Boracay, Davao, and Zamboanga.